The Homestead Act of 1862, considered one of the most significant pieces of legislation in American history, persuaded eastern-European immigrants, adventure-seekers in the East, and women seeking independence to embrace the notion of founding a home place out on the desolate prairies of the Dakotas, the wooded timber regions of Minnesota, the valleyed mountains of Colorado, and the expansive plains of Nebraska. The Homestead Act led the legislative course of successive homestead laws, rules and regulations and congressional provisions that opened up western lands for settlement. 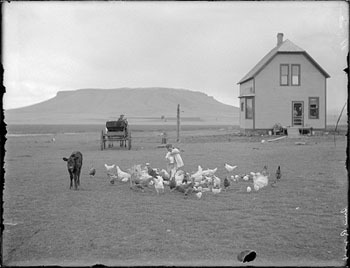 Homestead acts were those which granted a free piece of land to a settler who would stay on the property, improve the tract with the building of a home and farm site, then return to the local land office and file the proof papers that would substantiate his or her efforts to meet the requirements of the law. When the proof papers were allowed, the new landowner received a patent. It is within these proof papers, packets in the custody of the National Archives and Records Administration that we come to understand our ancestors' struggles and appreciate their satisfaction as they registered their patents in the county courthouse, securing ownership. Decades earlier, homestead legislation had been introduced and repeatedly struck down. In the 1830s, the power of the Eastern industrialists swayed Congress against homesteading, wishing not to lose their laborers who worked for low wages, lived in tenements, who had no easy opportunities of upward mobility and escape from the dreary work conditions and crowded living conditions. The promise of free land and wide open spaces was too much for the factory owners to agree to, and homestead legislation stalled. In the 1840s, the Irish famine immigrants flooded the labor market and eastern opposition eased. Additionally, the western expansion territories required eastern products, and the capitalists realized opportunity superseded homestead resistance. But the Southern congressmen always vehemently opposed homesteading, recognizing the futility of small land owners to appreciate the assets of slavery, and recognizing the resistance of immigrants, themselves departing oppressive regimes, to enslave yet another population. In 1848, the Free Soil Party, a short-lived but effective political party espoused free land, free soil, and free men. The party elected several members to Congress and more significantly, established homestead legislation as a popular civic idea. In 1854, the Free Soilers folded into the Republican Party, which seized the idea into its own political platform, and in 1860, Abraham Lincoln, Republican, became president. In 1861 the Southerners left the halls of Congress, removing homestead opposition, and a year later the Homestead Act (HA) was signed into law, to become effective at midnight of January 1, 1863. Significantly, the Emancipation Proclamation went into effect the same day. Preliminary to homesteading, the preemption acts (the Preemption Act of 1830 and the Preemption Act of 1841) signaled the 160-acre-tract idea of granting at a low price to a settler an easy way to begin a farm and develop a family life. The preemption acts were not homestead acts, as a settler had first rights to purchase his land, but it indicated a willingness of the federal government to acquiesce to early pioneers' wishes to own a piece of land on easy terms. For our purposes, a 'homesteader' is a man or a woman who is going to receive a free grant of land after satisfying the requirements of the act under which the claimant is proving up a homestead. The most common homestead law characteristics were: a 160-acre tract, that is, a quarter-section of land being offered for settlement; most homesteaders were men, but many of them were women, there was no distinction in any of the homestead laws that a woman could not homestead, this being an example of a first time a woman could own her own property; commonly homesteaders were age 21 years of older, although a younger person could homestead if he had served military service; the time for occupation and improvement was 5 years, although, later acts amended this occupancy time requirement. 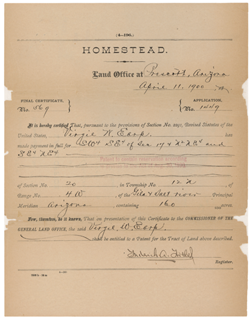 The Homestead Act required the claimant to file proof papers. These documents asked questions along the lines of "what improvements have been made" and "when did you establish residency"; questions whose answers offer us information about the daily details of life of this family at this time in their lives. We discover what crops were planted, the number of acres, and the worth of these products in the dollar value. (It is interesting to compare the dollar values of then to that of today. A useful consumer index inflation calculator web site is here. One of the questions "are you a native-born citizen of the US..." would lead the astute researcher to a new location of research. If the claimant was an immigrant, a citizenship paper would provide the court, county and state granting citizenship, or a copy of a declaration of intent, providing another location to do family research. There were fees to be paid: a fee to apply for a homestead, fees for the land office officials to perform their tasks; fees for translators, so the land is free, but the homesteader certainly had to come up with money to pay the filing fees. A homesteader needed money to purchase work animals, milk cows, farm tools, materials to build the buildings, and living expenses, so this was not a "free" activity. Many a claimant gave up when it became too much for the unprepared settler. Military records might be found within a homestead packet. The Homestead Act of 1862 and subsequent acts granted the right to a military veteran who had served in actual war the right to count military service as time served for the residency requirement. In other words, if a soldier served in World War I, or the Philippine War, or the Spanish American War, his time could be counted as residency. This is for homesteaders who had applied for a claim, then went into the service. If a veteran is wounded during service, even if it's on the first day of service, and is medically discharged, the entire time for which he had signed up for would be counted toward his residency requirement, even if he was back home within a month. The veteran needed to prove to the GLO that he did the service, so his military papers would have been included in the files, providing proof of service, the dates he served, where he served, and like papers. The Southern Homestead Act of 1866 was passed to help the newly freed slaves gain the benefits of homesteading. A claimant could receive up to 80 acres in the states of Alabama, Mississippi, Louisiana, Arkansas, and Florida. These states had already been settled for decades, the good land already taken up, fraudulent administrators, and the impoverishment of the freedmen who could not afford even the fees doomed the measure to failure, and was repealed. The Timber Culture Act, passed in 1873, was a homestead act that had no residency requirement, but required the entryman to plant trees. The measure was meant to populate the vast treeless prairie with shelter belts. In 1904 the Kinkaid Act was passed specifically for the western half of Nebraska. It said, a homesteader could have up to 640 acres. This is four times the acreage allowed in the original Homestead Act. The property required improvements, and could be attached to a previous homestead claim. In 1909 the Enlarged Homestead Act allowed a claimant to settle up to 320 acres, double the original homestead amount. This act acknowledged the struggles of western settlers to sustain their families on arid tracts. The Stock Raising Act of 1916 granted 640 acres to a settler for the purposes of raising stock. This tract required no cultivation, but instead, improvements needed to be made within 3 years to the value of $1.25 an acre. Within the papers are several examples of your ancestor's original signature written upon affidavits, court statements, and official declarations. In cases of similar family names within a region and similar age group, a homestead signature may confirm identity to an individual. Proof papers required the testimonies of the claimant plus two "credible" witnesses, neighbors who confirmed the truth of the claimant's compliance with provisions of the act. These witnesses are persons of interest: future in-laws, aunts, uncles, siblings of the claimant's family may be represented within these names, offering the wise genealogist new avenues of research. A homesteader was required to publish public notice in the local newspaper. Here you can read the precise name of the newspaper published in that area during that time. Newspapers came and went over the years, but here you have the exact name of the local newspaper during those years. Where Can You Find These Records? The homestead records are held by the National Archives and Records Administration (NARA) at the National Archives Building in Washington DC. These are the original documents sent to the General Land Office (GLO), which later became the Bureau of Land Management. These documents are public records. Copies of the documents may be ordered online from the NARA website at www.archives.gov. Alternatively, copies may be ordered by downloading a PDF form which may be completed and mailed to NARA. The most personal way to see the records is to visit NARA and request the packet. The documents are delivered to the research room, where you can make copies as well as see the original documents. In 1976, all homestead acts were repealed, except in Alaska where ten more years were given for homesteading. The last homesteader was a Vietnam veteran who proved up an Alaskan claim in 1986. The Homestead Act contributed considerably to the advancement of settlement across the western frontier. The authors of the laws likely gave no thought to the historic import of the documents and letters contained within the proof packets, but for us, they provide details of the daily lives of our ancestors found nowhere else. The Bureau of Land Management website where you may search for patents by patentee name. The database is not complete. Archives.gov is the website for the National Archives and Records Administration, where a researcher may order copies of land entry records. Answers.com offers an overview of federal land policy and land disposal since post-Revolutionary times. NPS.gov is the website for Homestead National Monument located in Beatrice, Nebraska. Billington, Ray Allen and Martin Ridge. Westward Expansion. Albuquerque: University of New Mexico Press, 2001. Brown, Dee. The Gentle Tamers. Lincoln: University of Nebraska Press, 1958. Gates, Paul W. History of Public Land Law Development. Washington, D.C.: Government Printing Office, 1968. 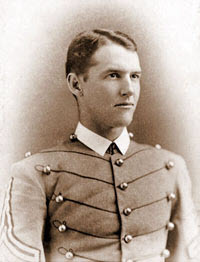 Hibbard, Benjamin Horace. A History of the Public Land Policies. Madison: University of Wisconsin Press, 1965. Laskin, David. The Children's Blizzard. New York: HarperCollins Publishers, Inc., 2004. Kramer, Marie. Homestead Fever. York, Nebraska: self-published, 1993. Linklater, Andro. Measuring America. New York: Walker Publishing Co., 2002. O'Gara, W.H. In All Its Fury. Lincoln: J & L Lee Books, 1973. Peavy, Linda and Ursula Smith. Pioneer Women. Norman: University of Oklahoma Press, 1998. Stratton, Joanna L. Pioneer Women. New York: Simon and Schuster, 1981. Welsch, Roger. Sod Walls. Lincoln, Nebraska: J & L Lee Co., 1991. White, C. Albert. Initial Points of the Rectangular Survey System. Westminster, Colorado: The Publishing House, 1983. White, C. Albert. A History of the Rectangular Survey System. Washington, D.C.: Government Printing Office, 1983.